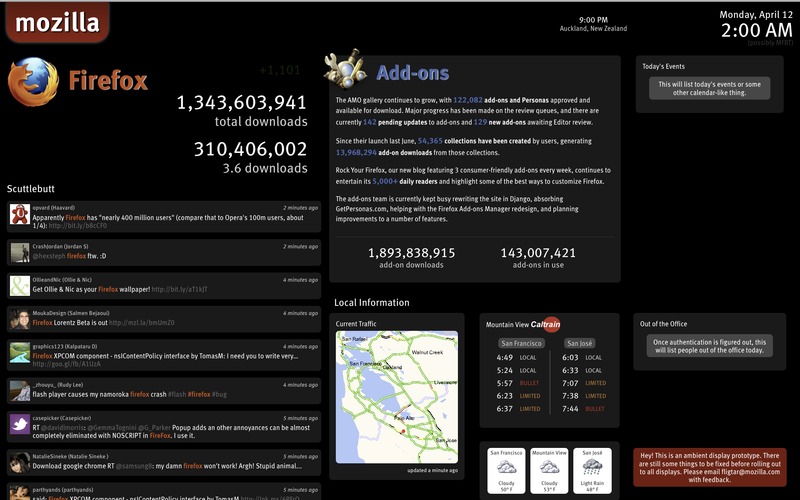 This is a live-updating dashboard that shows real-time Firefox 3.6 download counts, Tweets about Firefox and Mozilla, local transportation information, upcoming events, local times at our worldwide offices, and a rotating module of various project information. Conveniently, we’d recently installed 4 huge displays throughout the office with built-in computers waiting for such a use, so I put up the first prototype on the screen nearest to me one day. It caused traffic jams all day as crowds of people stopped to read the tweets and comment on them. One problem I noticed immediately was that the interest in the displays could change dramatically from one minute to the next depending on the tweets shown at the time. If you walk past and only see retweets of a TechCrunch article about Firefox or tweets in a language you don’t understand, it’s not very interesting. I addressed this by adding an interactive element to the displays: letting users “favorite” interesting tweets, which would then be stuck on the display for much longer. 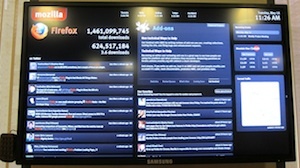 As shown above, there are two Twitter columns: the one on the left is the live stream of tweets involving Firefox and Mozilla, each with a unique number 0 – 9. If one of those tweets is noteworthy, its number can be pressed on the numeric keypad attached to the display and it will move to the right column of Favorite Tweets. Favorite tweets are retweeted by the @mozillafavs account so that anyone can follow along, which also means the tweet author will see that we noticed it. We favorite everything from favorable and insightful tweets to unfavorable and very unfavorable tweets. For me, monitoring the mood of Twitter users has been very helpful in understanding what users don’t like about Firefox and what our pain points are, at least from that group. And I (and others) have responded to frustrated users we’ve noticed on the displays who needed support. This was a spare time project, so I haven’t been able to work on it as much as I’d like, but I’m still slowly making improvements. 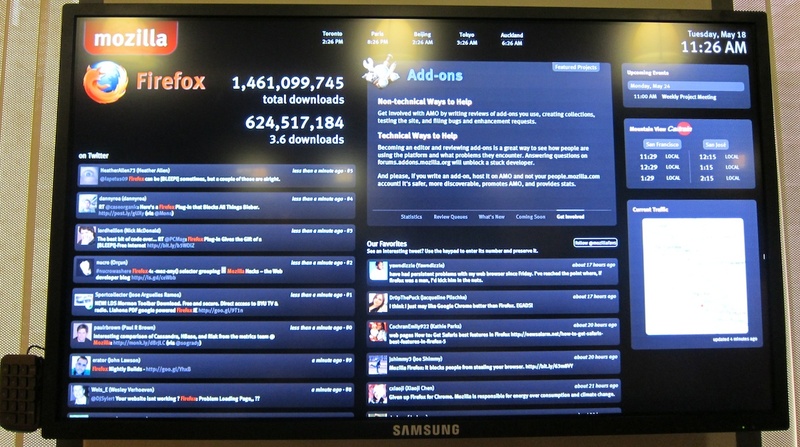 With help from our metrics team, we plan to add much more interesting stats that give a more up-to-date view of how Firefox is doing than overall downloads. Client-side graphing may not be possible due to the very very weak Windows XP Embedded computers built into the displays (even CSS transitions were too taxing). I also want to add more rotating projects besides the add-ons module, likely to include SUMO information, arewefastyet.com, and shaverfacts.com.